We have a lot of clients who visit the studio to buy jewelry. Many of them wear their jewelry for a long time, sometimes years, without changing it. 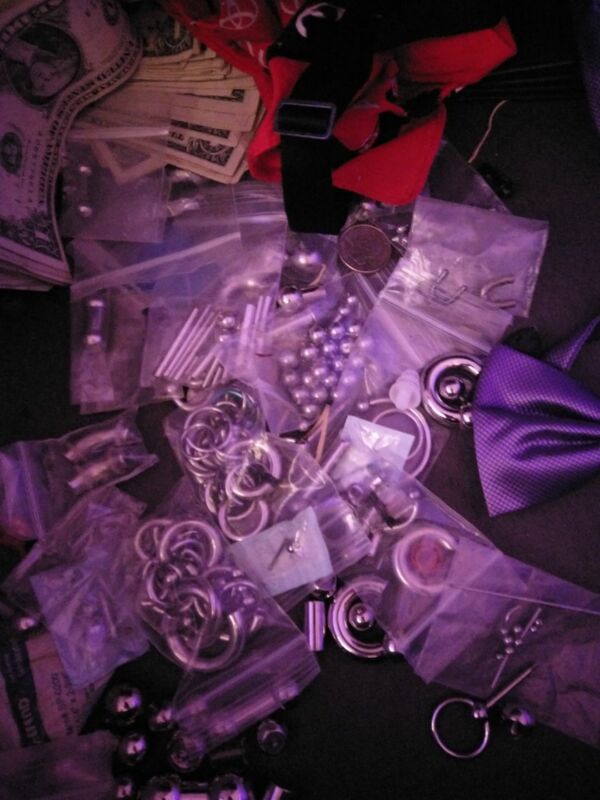 For these people, losing jewelry is the only reason to buy something new. We’ve figured out these clients don’t feel comfortable changing jewelry on their own. However, the clients who can change their jewelry on their own often do. As a result, they buy enough jewelry to have a nice collection at home. 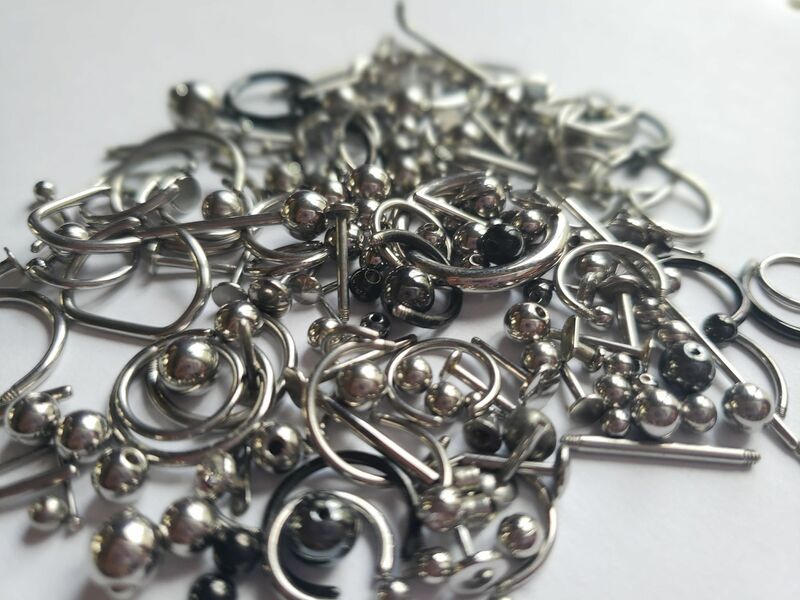 There are many different reasons to stop wearing jewelry in our piercings. We “retire” piercings somet imes for professional or educational needs. Maybe they eventually give us enough problems and retiring the piercing is the easiest option. Maybe someone’s style changes and their piercings no longer reflect how they want to look. 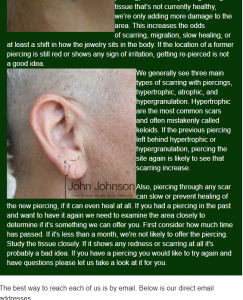 There’s no wrong reason for abandoning a piercing. But if someone has a lot of jewelry in their collection, where does it go? The above and below pictures were sent to us by our friend Janessa McKissack who piercers at Mint in Ankeny, Iowa. 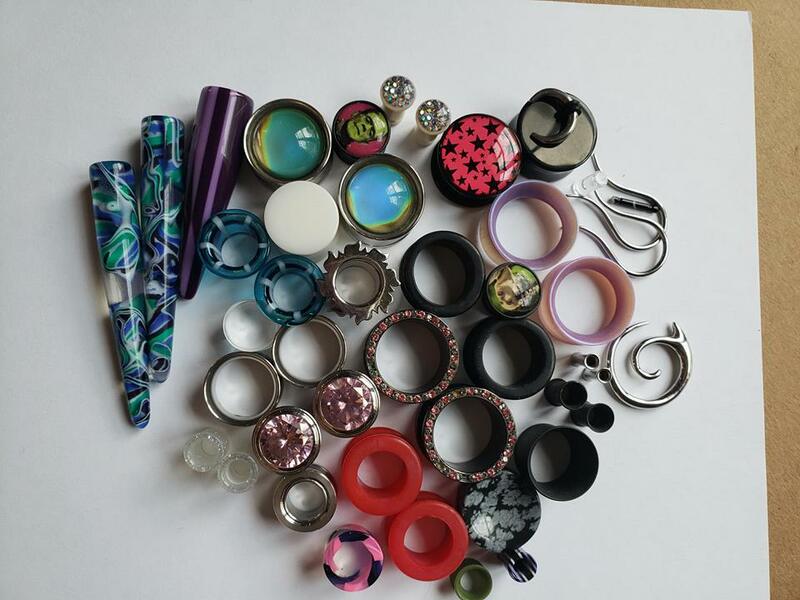 “I’ve got many plugs and things in my collection, but this is where it all started. 16 year old me, working my first job at the mall with access to all the brightly colored mystery material I could get my hands on. As a teenager, my favorite part about visiting the mall was checking out the rotating acrylic displays full of fun shapes and colors. If only I knew then what I know now! 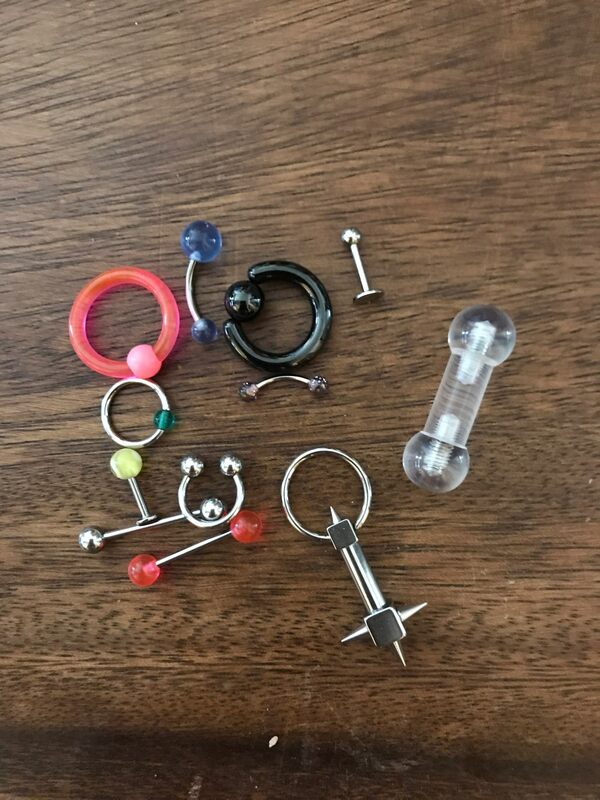 Before now, have you considered what an outdated jewelry collection looks like for a piercer? Imagine a 20 year old pile of jewelry. This picture was sent to us by Mic Rawls who pierces at Cold Steel America in San Francisco. 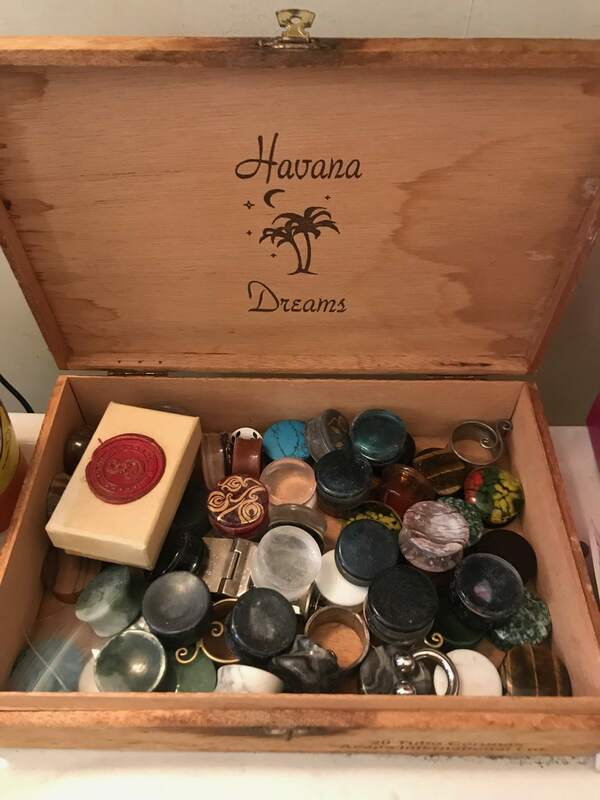 For over 20 years he’s kept his collection in an old lunch box. This image shows jewelry from Good Art , Gauntlet, and Spectrum Crafts. Jewelry from these brands would be considered antiques to modern piercers. 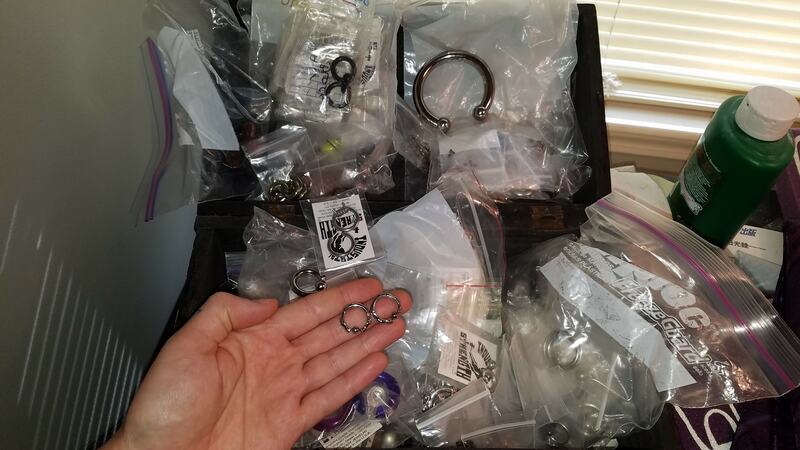 When we called Ryan Oullette from Precision Body Arts in Nashua, New Hampshire to ask if he’d share images with us showing his old jewelry collection he said he was standing next to it and immediately sent us some pics to share with you. 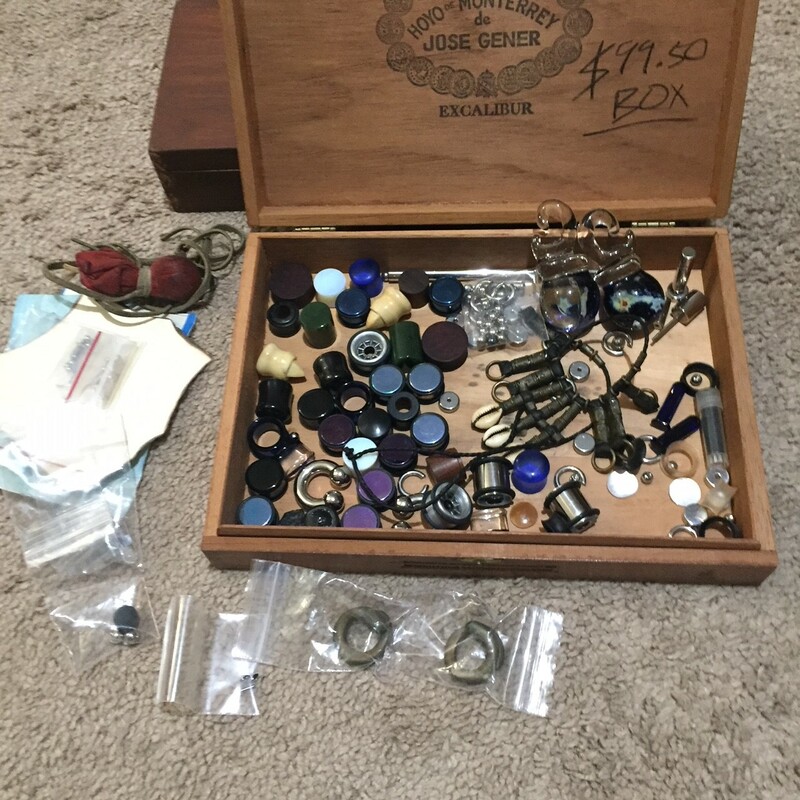 Cigar boxes were once a popular place to store wood plugs for stretched ears. This picture shows some hematite and jade plugs with some early Tawapa eyelets with filigree. The turquoise plug is actually Howlite, a cheap stone that can be dyed. As our preferences for jewelry evolve, our collection of unnecessary jewelry grows. The gold eyelet in this picture is actually glass from Glasswear Studios. There’s a very thin layer of real gold inside, but the clear glass gives the illusion of being solid gold. These were popular sometime around 2000. Most of the jewelry in this image would be great examples of low quality today. Unfortunately poor material and design still dominate the body jewelry world. 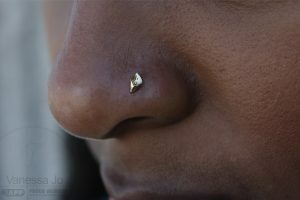 Most piercings and jewelry like this are still popular because of the low cost. 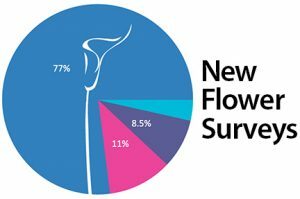 If you spend your time in studios like New Flower you may not be exposed to these types of products often. 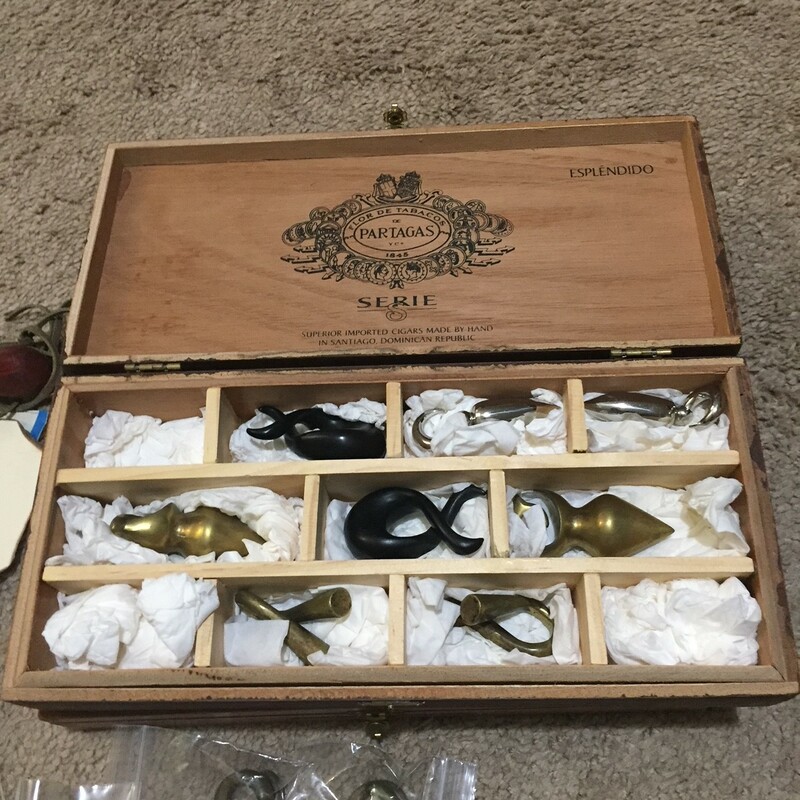 John Johnson’s mentor, Kent Fazekas, offered up a picture of his cigar box of jewelry. 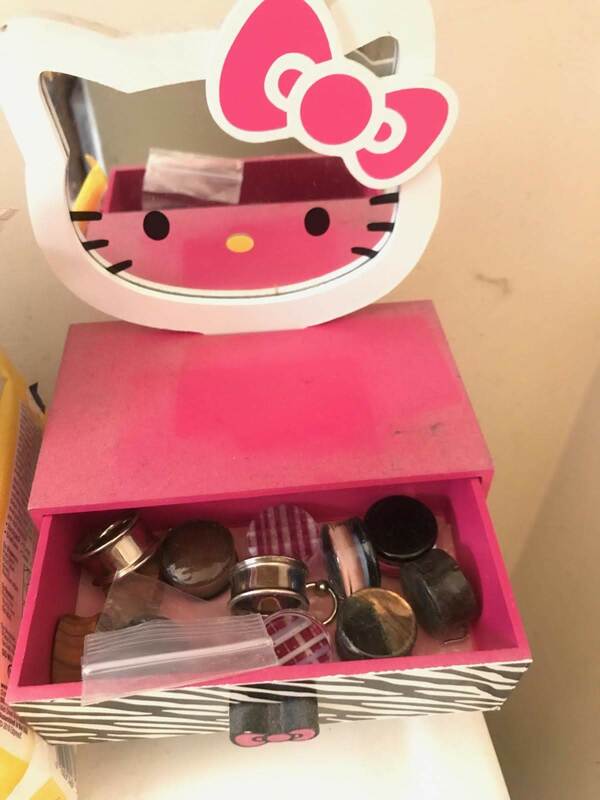 We guarantee there are collections that look like this all over the world in the homes of piercers from the 1990’s and before. 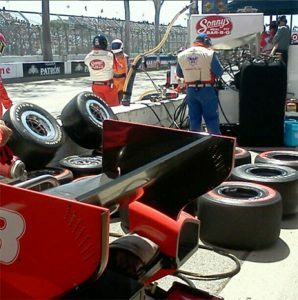 This is another image from Kent’s private collection. You can see that he valued these pieces enough to arrange them carefully. These pieces are actually still very nice, even if they’re not worn. 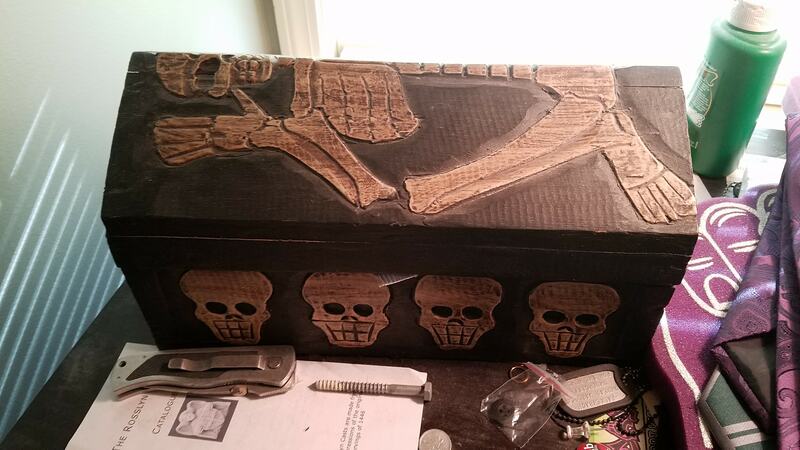 He said this box hasn’t even been opened in many years. The jewelry sold today in professional piercing studios is often times high quality like gold with precious and semi-precious gems and stones. A lot of what you’re buying today won’t likely be junk in the future. Piercing really has come a long way. 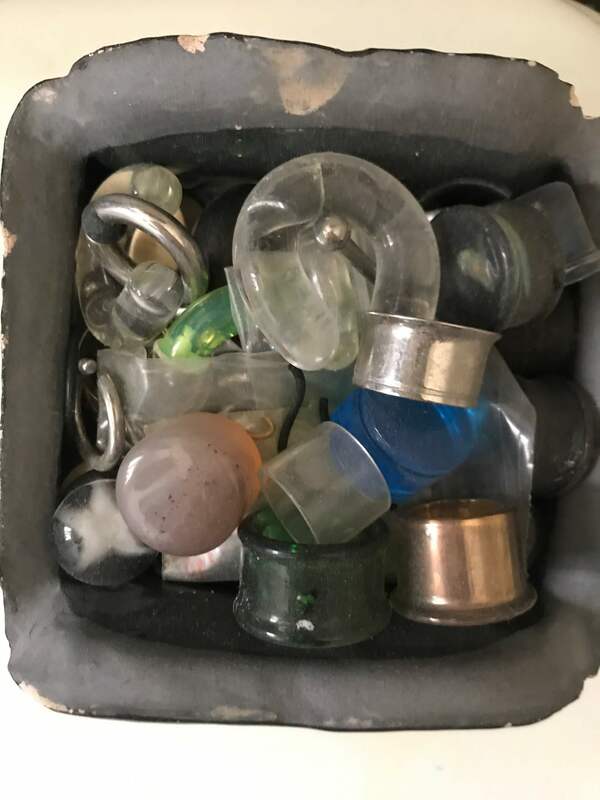 But, perhaps someday you’ll be doing some spring cleaning and looking for old stuff to get rid of and find your own outdated body jewelry you might laugh at now or don’t even remember wearing. If so, we hope you tell us about it!